The Three Sisters all work together. Critters will find it harder to invade your garden by interplanting your corn, beans and squash. The corn stalk serves as a pole for the beans, the beans help to add the nitrogen to the soil that the corn needs, and the squash provides a ground cover of shade that helps the soil retain moisture. 1. In late May or early June, hoe up the ground and heap the earth into piles about a foot high and about 24 inches across. The centers of your mounds should be about four feet apart and should have flattened tops. 2. 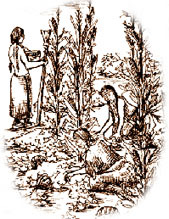 First, in the center of each mound, plant five or six corn kernels in a small circle. 3. 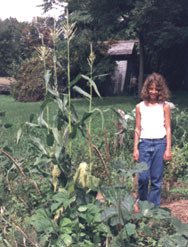 After a week or two, when the corn has grown to be five inches or so, plant seven or eight pole beans in a circle about six inches away from the corn kernels. 4. A week later, at the edge of the mound about a foot away from the beans, plant seven or eight squash or pumpkin seeds. 5. When the plants begin to grow, you will need to weed out all but a few of the sturdiest of the corn plants from each mound. Also keep the sturdiest of the bean and squash plants and weed out the weaker ones. 6. As the corn and beans grow up, you want to make sure that the beans are supported by cornstalks, wrapping around the corn. The squash will crawl out between the mounds, around the corn and beans.